Independent of any source, display, HDMI cable, control system, network connectivity, etc., compromised HDBaseT connections may cause some AT-UHD-PRO3 matrices to be randomly losing one or more HDBaseT outputs, and a power cycle temporarily resolves the challenge. It may only occur at certain job-sites, but potentially across multiple job-sites, and it may seem unrelated to a specific port #. Running the HDBT test on a compromised/intermittent HDBaseT connection may result in an “HDBT Board Monitor Fail”, and potentially all HDBaseT outputs may fail until the next power cycle. Disconnect your HDBT connections at the matrix. 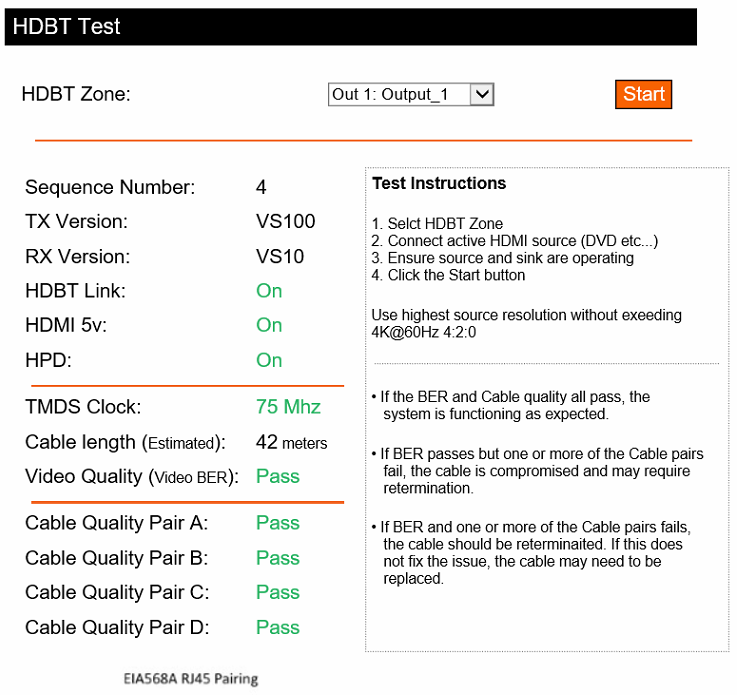 Run the HDBT test on each output one-by-one. As soon as the HDBT Board Monitor Fail occurs, note that the associated HDBaseT run may be compromised and disconnect it from the system. Continue running the HDBT test on the remaining outputs one-by-one, noting the associated runs that may be compromised and disconnecting them from the system. Remove the HDBaseT Receiver from the display and take it to the matrix. Using a short factory-made category cable, temporarily test using a known working HDBaseT output. If this HDBaseT receiver experiences any challenges, it may need be compromised and require replacement. Continue testing each remaining HDBaseT Receiver. For each compromised HDBaseT receiver, capture the serial numbers and prepare them for replacement. 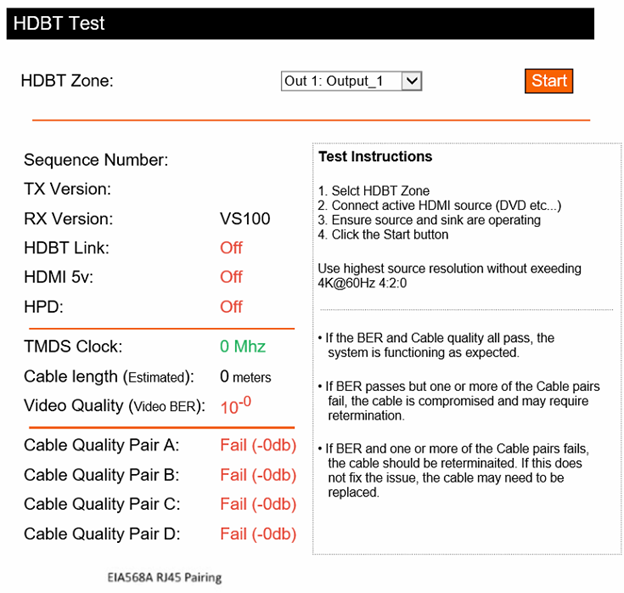 Using a known working HDBaseT Receiver with the short factory-made category cable, test each HDBaseT output that resulted in an HDBT Board Monitor Failure. If the matrix experiences another HDBT Board Monitor Failure, then this port may be compromised due to a compromised HDBaseT cable requiring retermination or replacement. If the matrix does not experience another HDBT Board Monitor Failure, then only the HDBaseT cable is compromised and requires retermination or replacement. If the matrix experiences HDBT Board Monitor Failures, document the ports at which these failures occur and process a replacement. If the matrix does not experience other HDBT Board Monitor Failures, then advise the customer to reterminate or replace the compromised HDBaseT cables. Once our engineering group has a finalized firmware which address these challenges, we will forward this firmware to you so that identifying compromised HDBaseT cables no longer presents this challenge. This level of troubleshooting will likely be a time consuming process that will be easier if you have 2 or more techs on site.